Plastic Trouser Hangers are available in a variety of styles when you come to specialist supplier Hang Plas. At our website you can choose from classic trouser hangers, plastic clip trouser hangers and waistline trouser hangers in a selection of styles and quantities. These styles can be further customised to suit your needs so that you can brand the hangers with your own logo with our printing service, or use your own company colours for the plastic. We are sure that you will be able to find the right design of hanger for your business when you come to us, and we are convinced you will be very happy with our competitive prices too. 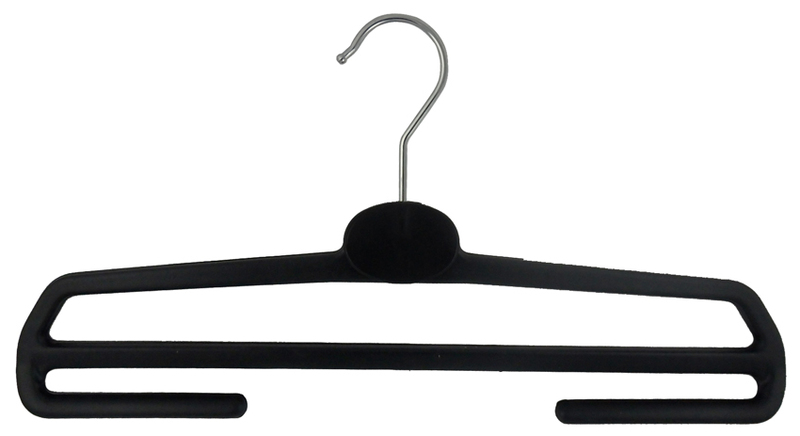 Plastic Trouser Hangers are available from the specialists in plastic hangers and wooden hangers; Hang Plas. We are a dedicated manufacturer of quality garment hangers and we can supply large quantities of hangers to suit your specifications. All of our hangers are manufactured to a high standard by our team at our purpose built factory in the West Midlands. Thanks to our 24 hour operation, we can turn round your hanger order very quickly so that you can receive your delivery as soon as possible. Please get in touch with us by calling 01902 607313 for more information.